Tuna was always a topic in the discussions between environmental activists, politicians and entrepreneurs. Tuna is one of the most demanded food fish worldwide. Now evidence of illegal, unregulated and unreported fishery off the Libyan coast is emerging. The assumption is that international as well as Libyan fish trawlers were illegally fishing in waters off the Libyan Coast during the time of warfare in Libya. The juridical standard for territorial waters in the Mediterranean Sea is 12 nautical miles. Within that area the coastal state has the exclusive authority of fishing. But Libya for its part lays claims on such rights for an extended exclusive fishing zone which includes the whole Gulf of Sirte. The waters off the Libyan coast are regarded as very rich fishing grounds whose abundance of species especially serves the Bluefin tuna as basic food resource. The Bluefin tuna which is the main target of the fishing vessels was recently classified as endangered species on the international Red List. While different environmental organizations demand a sanctuary for the affected area, activist groups such as Sea Shepherd started to run a campaign for the conservation of Bluefin Tuna in the Mediterranean Sea. 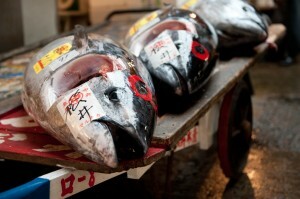 Under the title “Blue Rage Mediterranean Bluefin Tuna Defense Campaign2011” it started taking well-directed actions. The aim is to stop the unregulated fishing on Bluefin tuna. Actions such as destroying tuna-cages for instance are seen as legitimate in the fight against IUU-fishery. According to an article published in June 2011 by SeaShepherd.org both themselves and the ICCAT confirmed that French fishing vessels left Malta towards Libyan waters although they did not have any fishing license for this season. It now remains to be seen how the ICCAT is going to deal with the accusations and the evidences environmental organizations as well as the EU Fishery Commission submitted. If violations of ICCAT rules can be prove both Libyan authorities and European fishing companies need to expect juridical consequences.